S.K. Cafe Brooke Hots Pvt. Ltd. 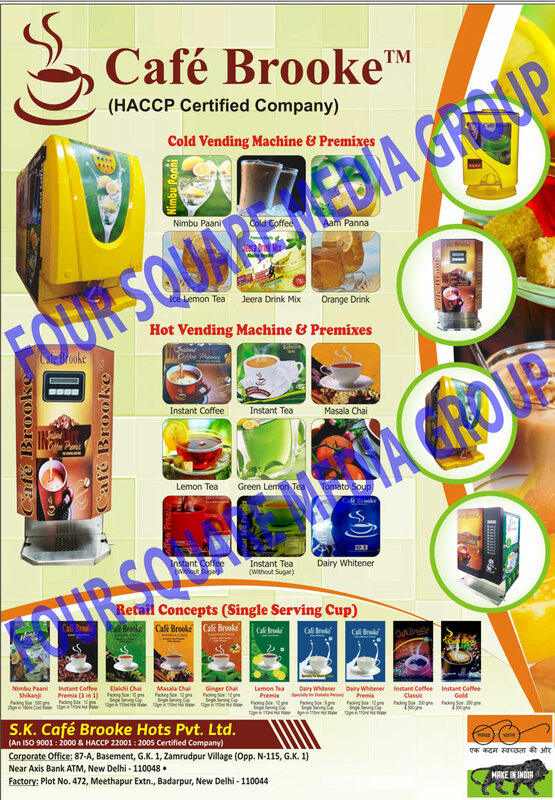 Cold Vending Machines, Nimbu Paani Premixes, Cold Coffee Premixes, Aam Panna Premixes, Ice Lemon Tea Premixes, Mix Jeera Drink Premixes, Orange Drink Premixes, Hot Vending Machines, Instant Coffee Premixes, Instant Tea Premixes, Masala Chai Premixes, Masala Tea Premixes, Lemon Tea Premixes, Green Lemon Tea Premixes, Tomato Soup Premixes, Instant Coffee Without Sugar Premixes, Instant Tea Without Sugar Premixes, Dairy Whitener Premixes, Elaichi Chai Premixes, Elaichi Tea Premixes, Ginger Chai Premixes, Ginger Tea Premixes as an active Manufacturer, Supplier, Dealer, Distributor, Trader and Seller etc. (*Importer/Exporter/Service Provider). Café Brooke now offer the complete Solution for the entire range of vending requirements. What distinguishes us from others is that we have in-house comprehensive production facility for Vending Machines, Instant Tea, Instant Coffee & other Products.